Read the Tips on entering and Terms and conditions before you begin planning and working on an entry. These contain important information on the structure and submission of entries. Pick a theme. The 2018 themes are divided into two categories. The first category is for 12-14 and 14-17 year olds. The second theme is for 18-21 and 22-25 year olds (see the themes below). Conduct your research - see Tips on entering for research suggestions. Create a piece of original content, based on your chosen theme, in one of the following formats: (a) News article; (b) Video/animation; (c) Audio recording; (d) Poster design. Submit your entry along with a completed entry form. You can download the appropriate entry form below. Age categories for entries are: 12-14; 15-17; 18-21; 21-25. The themes are divided into categories based on age. Entries will be accepted as a group project or an individual entry. Entrants can enter the competition as many times as they like by entering different formats on one or both themes OR by participating in a group project and submitting an individual entry. Theme 1: Club drugs – what are the risks? Theme 2: Performance and image enhancing drugs – what are the risks? Entry forms are divided into two age categories. 12-17 and 18-25 please select the appropriate entry form below. News articles will be accepted by e-mail only (in Microsoft Word or PDF format). Word count should be between 600 - 1,000 words. Video/animation, audio and poster entries will be accepted by e-mail OR on a disc/memory stick through the postal service. Video/animation files will only be accepted in the following formats: .flv; .mp4; .mov; .mpeg. Audio files will only be accepted in the following formats: .wav or .mp3. Entries submitted through the postal service will only be accepted on on CD-R, DVD Video, DVD-R or USB memory stick. Please note, we are not in a position to return discs or memory sticks. The maximum file size accepted via email for all formats is 24MB. There is no upper file size restrictions on entries submitted through the postal service. The address for email entries is awards@drugs.ie. All entries submitted by e-mail will receive a correspondence as confirmation of receipt - if you do not receive an email confirmation of receipt your entry has not been received so please follow up with us. 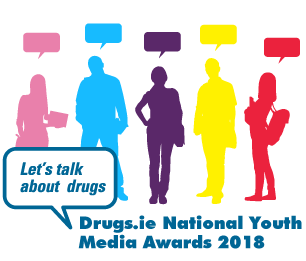 The address for postal entries is Drugs.ie National Youth Media Awards, The Ana Liffey Drug Project, 48 Middle Abbey Street, Dublin 1. Please email awards@drugs.ie if you have any further queries.